In certain Colorado communities and within specific content areas, that’s become an increasingly serious challenge. And as you’ve likely heard, Colorado is in the midst of a severe teacher shortage. Question 1: Does all of Colorado suffer from a teacher shortage? Question 2: How many teachers did Colorado educator preparation programs produce in the most recent academic year? 1,000, 5,000, or 10,000? Question 3: Does that represent an increase or a decrease from five years ago? Answer: A decrease of 17 percent. Question 4: What percentage of teachers in Colorado are of color? Answer: 9 percent. Yet 46 percent of Colorado K-12 students are of color. Question 5: The most acute teacher shortages are in what type of school, urban, rural, or suburban? Enrollment in teacher prep programs is declining, and the number of teachers finishing programs and obtaining a credential is declining as well. Between the 2010-11 academic year and 2015-16, enrollment in teacher prep programs dropped by 24 percent, and completers dropped by 17 percent. This decline occurred during a period of robust population growth in Colorado. This requires the state to import 50 percent of its teaching force, at considerable expense. 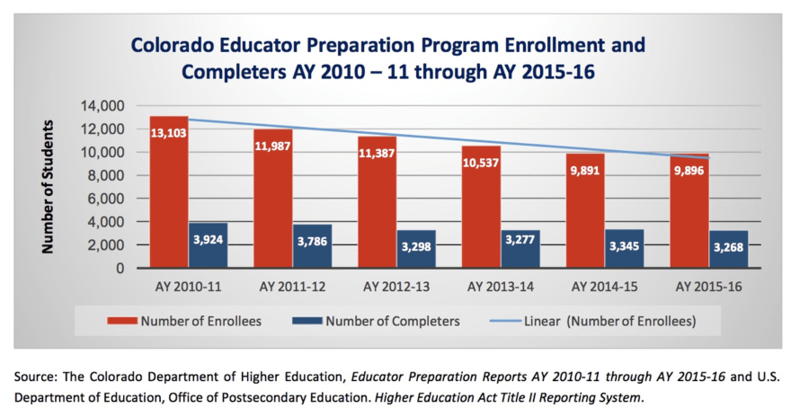 Nationally, by comparison, teacher prep program enrollees have dropped by 39 percent and completers by 21 percent. This problem is likely to grow worse before it gets better. Just 3 percent of Colorado teacher prep completers last year specialized in math; 4 percent in science, and 9 percent in special education. Many rural school districts in Colorado suffer from teacher shortages. 77 percent of Colorado’s 196 school districts are rural, and they face daunting challenges recruiting teachers. These challenges include inadequate compensation. The average annual teacher salary in rural Colorado districts is just $22,700. Overall, 95 percent of Colorado school district salaries are lower than the cost of living in those communities. Finding an affordable place to live on such a low salary is especially tough, particularly in mountain communities with high cost of living expenses. Money aside, it can be challenging to attract teachers to rural communities. Most new teachers are young, and most young people prefer to live in livelier, urban communities. Attracting teachers of color is especially challenging in rural districts. Another persistent shortage is in teachers of color. 47 percent of Colorado PreK-12 students are of color, but just 12 percent of the state’s public-school teachers are of color. Why does this matter? Research demonstrates that when there is a racial match between students and teachers of color, there are better student outcomes, especially in high-poverty environments and with at-risk populations. It’s also important for white students to have experiences with teachers of color, as such exposure helps to overcome the cultural and racial isolation often resulting from communities that are segregated through housing, schools, and economics. Getting young teachers to stay in teaching long-term is also problematic. Colorado loses 16 percent – about one in six – new teachers within their first five years in the classroom. This means that just as they are gaining enough experience to be at their most effective, a significant number of them leave for other opportunities. There are a variety of reasons for this, ranging from feeling underprepared for the challenges of the classroom to low pay to poor leadership in the school. The inflexible nature of their retirement plans through Colorado PERA also plays a role. PERA benefits are back-loaded, meaning early career teachers’ salaries are deflated by pension costs. Making matters worse, those same teachers will receive little benefit unless they remain in PERA for 20 or more years. Further, PERA benefits are not portable, meaning they cannot be rolled into another retirement plan if teachers choose to leave the state to teach elsewhere, or to leave the profession altogether. While these challenges are difficult to overcome, there are concrete steps that could address them. The state needs to collect better data on current and projected hiring needs. Such data on schools and districts would help align preparation programs to needs in schools. The Colorado Department of Education must work closely with teacher preparation programs to align the teacher supply pipeline to produce the candidates Colorado schools need most (e.g. rural, math, science, special education). Recent policy changes allowing STEM professionals to co-teach classes must be strengthened and spread across the state. 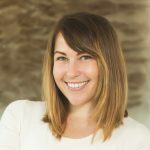 Colorado must also enhance teaching as a viable, exciting long-term career option, by providing competitive compensation, flexible and secure retirement benefits, working conditions, and strong school leadership, thus ensuring college graduates want to become teachers and new teachers want to continue teaching. Students first – Colorado must develop a detailed plan for ensuring a robust and diverse educator talent pipeline aligned to current and projected hiring needs. Transparency – Colorado must collect the right hiring and demographic data regularly to align supply and demand. Choice and innovation – Colorado must remove unnecessary barriers and invest in what it values, providing incentives and encouragement around innovative partnerships, compensation systems, retirement systems, and human capital management systems that are focused on recruiting, rewarding, and retaining highly effective talent. Accountability – The state must make better use of data on preparation programs to drive continuous improvement and ensure only high-quality programs are reaccredited. Colorado Succeeds is committed to supporting great teachers and leaders and will continue to promote innovative strategies for addressing the challenge of recruiting and retaining top talent to the profession.